Place water into gallon sized pitcher and add salt. 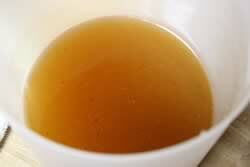 Stir until dissolved then add rub and stir briskly to mix. 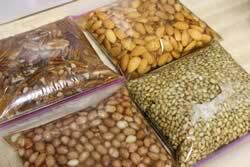 Place nuts into individual quart sized ziplocs and fill with brine. Zip closed and let them soak for 2 to 4 hours on cabinet top or other flat surface. 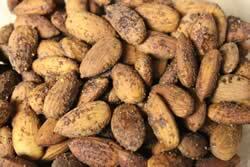 Pictured here I have pecans, almonds, raw red skinned peanuts and sunflower seeds brining. I wanted to use my rub recipe on the nuts but I wanted a finer texture so I ran some of the rub through the coffee grinder and it was perfect! Fine, silky and delicious.. 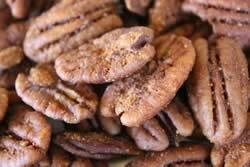 When the nuts are finished brining, drain the water and pour the nuts out onto paper towels to drain. Once they have finished draining, place them in separate bowls and set aside. 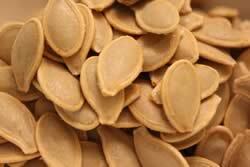 Dissolve salt into water in a medium sauce pan then add pumpkin seeds. Place pan on burner over medium heat and allow it to come to a boil. Allow to simmer for about 8-12 minutes then remove from heat. Pour seeds/brine into a wire strainer over the sink to remove the pumpkin seeds and pour them out on a paper towel to drain for a few minutes. Note: don't leave them too long or they might stick to the paper towel. 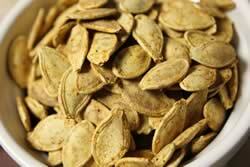 After a few minutes, place the pumpkin seeds in a bowl and set aside. Use spray oil/butter to coat the seeds with oil in the bowl as this will help the seasoning to stick better. 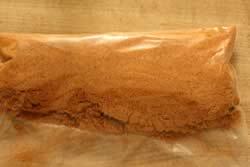 Add about 1 heaping tablespoons of my rub (ground fine if possible) per 1 cup of nuts or seeds and stir to coat evenly. 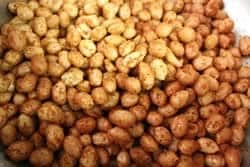 Peanuts coated with my rub..
Once all of the seeds and nuts are coated with the rub, they can be placed into a mesh grill topper or into Bradley racks or a cooling rack lined with foil. Please note that Bradley warns against the use of foil lined racks or foil pans in the Bradley smoker as this can cause a serious fire. Maintain a temperature of 230°F in the smoker. For the Pecans, almonds and pumpkin seeds, I applied cherry smoke for 2 hours and allowed them to cook for an additional 2 hours. The peanuts got the same smoke time but needed an extra hour or so to get finished. The best way to do this is to let them smoke cook for about 2 hours at the recommended temperature then do a taste test every 30 minutes until you like the way they taste and look. Note: the peanuts will remain soft until they cool down so “crunchiness” is not a determining factor of doneness. Here's some finished shots and boy where they tasty.. my kids went nuts (pun intended) for these, especially the pecans and the pumpkin seeds. 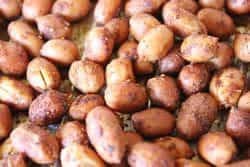 Are magnolia seed pods good for smoking meat? I recently read that cooking with stainless steel is not a good idea due to the chemicals used in the manufacturing process of the metal – is there any way to clean this residue off before cooking? Can it be burned off? Stainless steel is perfect for cooking as long as it’s clean. There are other blends like galvanized that are not good for food and especially at high temperatures but many smoker manufacturers use stainless steel for grates and lots of cookware is made from stainless steel. I think a stainless steel mesh or cloth would work fine as long as the opening are small enough so the seed, nuts or whatever you are smoking will fall though. You can place cut-to-fit stainless steel mesh onto a Bradley rack or Weber Grill pan as well. In the absence of this mesh, you can use a cookie sheet and just stir the nuts/seeds occasionally for proper smoke coverage. got your book on smoking meat for Christmas last year , and I really love all your rubs and brines.